Akhilesh Yadav suggested that the party could bargain later if an alliance materialises, but added that he was open to "friendships" with like-minded parties. Samajwadi Party chief Akhilesh Yadav said he was working on strengthening the party's vote bank. 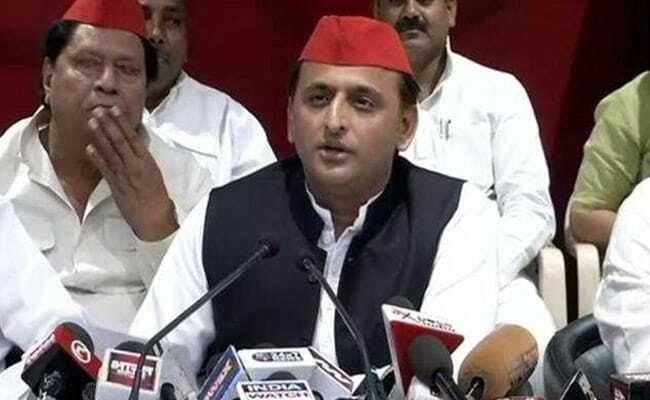 Akhilesh Yadav, singed by his failed partnership with the Congress for last year's Uttar Pradesh election that saw the BJP taking power, has described talk of alliances a "waste of time" and said his priority ahead of the 2019 national election is to strengthen the Samajwadi Party. "The 2019 election is certainly crucial as the message from Uttar Pradesh will go out to the entire country. As of now, I am not thinking of an alliance with any party. It (alliance talks and seat negotiations) wastes a lot of time and I don't want to be in confusion (over seats)," Mr Yadav told the Press Trust of India in an exclusive interview. The former Chief Minister suggested that the party could bargain later if an alliance materialises, but added that he was open to "friendships" with like-minded parties. The BJP's Amit Malviya commented in a tweet this morning: "Samajwadi Party decides to dump Rahul Gandhi's Congress for 2019 general elections. So much for 'UP के लड़के'! Next it should ask its spokespersons to stop defending the Congress, some of them have forgotten they speak for a regional party." The Samajwadi Party-Congress partnership, which famously pitched the Akhilesh Yadav-Rahul Gandhi combo as "UP Ke Ladke (The young men of UP)", was decimated in the state election. The ruling Samajwadi Party was reduced to 47 seats and the Congress won just seven seats in the 403-member assembly. The BJP's Yogi Adityanath took over as Chief Minister with the party and its allies scoring a spectacular 325 seats. "There is time before the elections. The Lok Sabha polls are in 2019. We are presently working on each seat, going through local equations for selection of candidates," Mr Yadav said, asserting that his party would contest the Lok Sabha polls where its organisation was strong. On the defeat of his party in the state despite claims of good development, Mr Yadav said the BJP had succeeded in fooling the people. "It was not our vote bank but that of the Bahujan Samaj Party that shifted... The people still remember my regime and are now realising their mistake." He added: "The Yogi Adityanath government has failed... They are just carrying forward our work by putting their plaques," he alleged.